Voltaire is the sire of our 2009 filly Escapade HS. 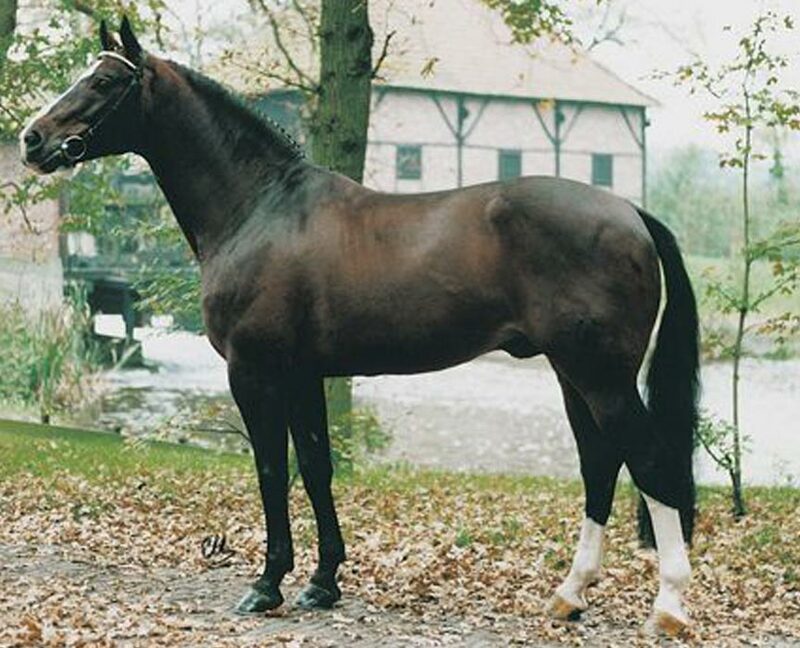 Voltaire was really the first of the super star performance stallions to go on and prove himself equally as important as a breeding stallion. In the competition arena, he won at the highest level, winning Nations Cup classes at Calgary, Stockholm, s’Hertogenbosch, Lanaken, Helsinki, Wiesbaden and Wembley. In 1989 he won the Grand Prix of Berlin. Voltaire is represented by a staggering 28! jumpers in the WBFSH standings for 2000/2001 – and is ranked 9th in the top 50 sires in the ten years from 1991 to 2000. It would seem that Voltaire’s influence will continue not just through his stallion sons but through his fillies. The bronze medal in the showjumping at Athens went to Royal Kaliber – by Ramiro but out of a Voltaire mare.